Every music aficionado loves to geek out over the best DJ headphones: but for a working DJ, they aren’t just a shiny new toy, but an essential piece of equipment. Quality ‘phones can make the crucial difference between a mismatched mess and a perfect transition, helping you to fine-tune your sets and mix as precisely as possible. As such, they’re undoubtedly one of the most important tools in any self-respecting selector’s arsenal. 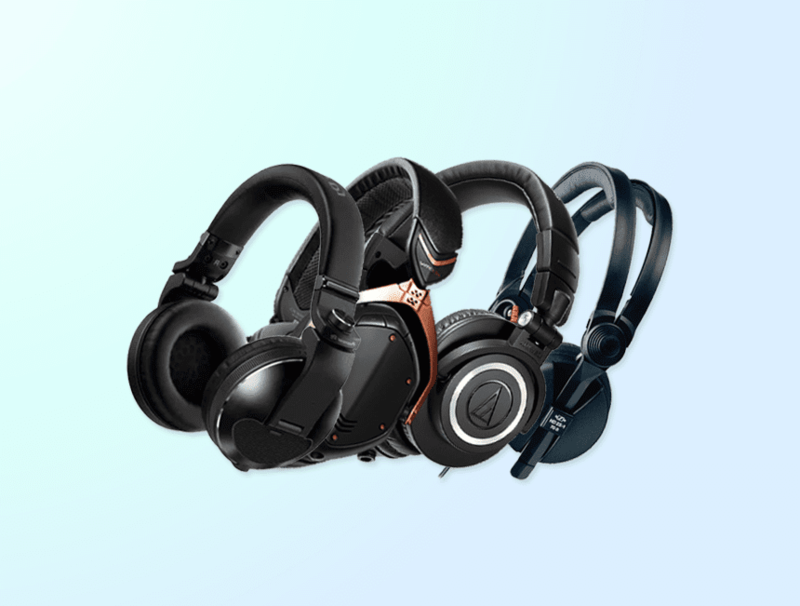 There’s a wide range of factors to consider when choosing from the best DJ headphones, from comfort and style, durability and price, to the all-important level of sound quality. With so many brands on the market and countless options to choose from, it can be a real headache figuring out which are the right pair for you: that’s valuable time that could be spent digging out new records, not googling tech reviews and comparing frequency ranges. Thankfully, we’ve got you covered: check out the list below for an overview of the best DJ headphones from AKG, Pioneer, Sennheiser and more. Pioneer’s HDJ-X10’s are at the top of their range, offering a closed-back, over-ear design that provides both comfort and sound isolation. They’ve got the usual impressive numbers: 3500mW maximum power input, 106dB SPL, and a frequency response of 5khz to 40khz, but the real draw is their robust and shock-resistant frame. These bad boys have been subjected to US Military Standard shock testing, proving that they can handle any party, no matter how wild. At 328g, they’re not exactly feather-light, but the added functionality of removable cables and connectors more than makes up for a couple extra grams. Sennheiser are a name synonymous with high-quality audiophile equipment, and their products rank among some of the best DJ headphones. The HD25s are another over-ear, closed-back selection, but unlike the Pioneer X10s, they lack a rotating earpiece and can’t be collapsed for portability. They do, however, pump up the volume a little higher, with a maximum SPL (sound pressure level) of 120db. Perfect for those industrial techno nights that your current headphones can’t compete with. Despite looking like something that might be worn by a spaceship pilot in a low-budget sci-fi movie, V-MODA’s M100 are actually a brilliant pair of headphones. With tried-and-tested durability and a reportedly unbreakable headband, these hexagonal beauties can withstand almost anything thrown their way. The sound quality is said to be top-notch, with excellent bass separation thanks to a patented dual-diaphragm design. And with an innovative foldable design and advanced portability, they’re perfect for a DJ that likes to travel. Though not quite as respected as Sennheiser or Pioneer, Audio-Technica are a popular brand that produces solid gear for a decent price. The M50x’s are good all-rounders, with great sound quality and a stylish aesthetic. Their newly-upgraded ear-pads improves upon earlier iterations that some users weren’t happy with, and there’s even an option of velvet-lined replacements should you wish to upgrade. This means superior comfort levels, and no more ear fatigue after your 8-hour marathon disco sets. AKG are one of the most respected names in world-class sonic equipment, and though the K81’s aren’t at the top end of their product range, they’re a high-quality pair of headphones that offer wide frequency response, closed-cup design and a handy little drawstring bag. Their mid-sized drivers are capable of an impressive sound that comfortably handles bass and mid-range frequencies, rendering them with a clarity and depth that parallels far more expensive models. To book a DJ from our extensive roster for your next event, get in touch today.